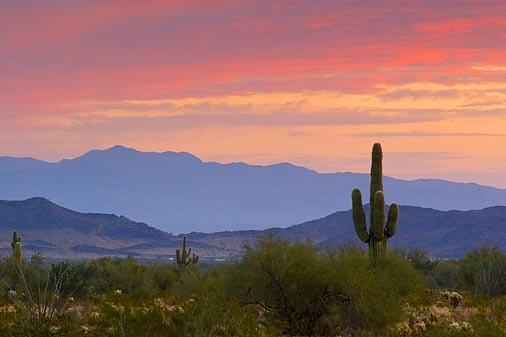 The sun comes up really early here in Arizona, especially as we inch closer and closer to the middle of the summer. I guess that's how it is everywhere, except we have the added curse bonus of not participating in Daylight Savings Time. I'm not sure why that is; some bozo legislators made that decision before I got here and I haven't been able to get them to change it. Thus, during the month of June the sun will be well into the sky by approximately 5:15 a.m. This is madness! As I lay in bed this morning at around 5:50 in my fully sunlit bedroom, I contemplated the fact that during the summer the sun is out for a majority of the 24 hours in a day in places like Alaska. Still groggy from sleeping, I couldn't quite wrap my brain around how that works. I know it has something to do with the earth's axis tilting toward the sun during the summer months (here in the northern hemisphere), but I couldn't get why if that is true it's still so much hotter here than there. If you just really have the burning need to leave me a comment and explain this to me, fine. Otherwise, I've moved on and I'm not really concerned about it. I just wanted you to know the kinds of things I think about before I have my morning coffee. But I've had my coffee now. I can't really complain about the sun coming up so early. It's handy when you want to go for an early morning walk or you have to catch an airplane in Tucson at 7:00 a.m. We have beautiful sunrises here and they do indeed set a lovely tone for the beginning of the day. When the sun comes up I feel like I have a brand new start. I'm one of those folks who literally, for the most part, puts yesterday behind me and embraces each new day as a beginning, a new chapter. Maybe I'm a little Pollyanna-ish that way, but when I step onto my back porch and see the bright orange and red frame around the eastern mountains, feel the crisp air, and smell the newness of the day (usually a blend of dryer sheets, bacon, coffee, and diesel fumes from school buses), I can't help but feel like I'm starting all over again. Of course then I step back into my house and it doesn't feel so much like a fresh start after all. The same dishes are in the sink, the same pile of laundry is waiting to be folded, the same dogs need to be fed the same food, and the same office beckons me to do the same thing I did yesterday. Some days "starting all over again" is the last thing we want to do, huh? It just means we're taking care of the same sick child all over again, driving to the same job all over again, dealing with the same marriage problems all over again, or staring at the same unpaid bills all over again. Yuck. But even if our problems are the same as they were yesterday, we can wake up to new opportunities today. Everything may not have become fresh and new overnight, but at least one thing did. Whatever time the sun came up in your world today you can know that with the rising of the sun also comes a new batch of God's goodness. In fact, I'm sure you don't even have to wait for the sun to come up to experience His fresh mercies and ever present faithfulness. But whatever the needs of the new day might be, God will graciously provide exactly the dose and brand of love, forgiveness, mercy, power, or wisdom you might need. Praise God for all things new! What do you need to look at with fresh eyes today? Do you, like me, have some issues that linger and linger, seemingly never being resolved? Or maybe, also like me, you just grow weary of the same chores, responsibilities, and dilemmas. The sun rising in the East may look beautiful and fresh, but those dirty carpets, unfinished work assignments, and empty lunch boxes surely don't! Let's embrace more than just the lovely sunrise today. Let's take that fresh dose of goodness from our God and paint our worlds with it!